Hey everyone. I'm new to the forums and a buddy from work told me about your site. I'm just starting to reload 45C for my Marlin 1894 Cowboy lever action. I'm primarily going to be using it for plinking but I would still like it to be accurate. I would also obviously like to keep my costs as low as possible. So I'd love suggestions on powder and bullets. Thanks! I use 5 grains of Clays, Large pistol primer, a 200 grain RNFP Magnus bullet. works great for me. I can hit the gong at 85 yards pretty handily too. There's plinking... and then there's PLINKIN'! If plinkin' with cast bullets... I like RedDot powder and use either a commerical 200 grain round flat nose bullet and a hand cast 225 grain truncated cone that I cast in a RCBS mold, (45-225-CAV). I've found good (maybe adequate), accuracy with between 6 & 6.9 grains of powder over a Winchester WLP primer. As you can see, these are not "pfft-tink" loads, but neither are they real barn burners. They were loaded at various times, and just dumped in an ammo can. Somewhere I have an pic of the targets I shot when I did this velocity check... but since I wasn't shooting for group, it's pretty meaningless. The 50th Lyman Reloading manual has a nice section for the 45Colt in their rifle section. Good range of loads for both cast and jacketed. I highly recommend anyone loading for a 45 Colt rifle get a copy. My favorite is 6.1gr Green Dot / 200gr Desperado Cowboy Bullet / Remington LPP / Starline / 1.55" OAL. Smooth pressure spike, 100% burn, 825~850 fps out of a 5-1/2" pistol bbl. I've tried others but keep coming back to this one. "... use 5 grains of Clays, Large pistol primer, a 200 grain RNFP Magnus bullet. works great for me. I can hit the gong at 85 yards pretty handily too...."
That's a pretty open-ended question and sounds like you're new to reloading? If so, acquire these manuals first and read everything in the chapters before the loading data sections. Otherwise all you'll get is pet loads from a lot of strangers without any understanding of whether they're what's best for you. Nah. None of the above. Starline brass. Federal Primers. APP about 20Gr, topped with Cream-0-Wheat and a 200Gr RNFP. Won't necessarily be cheap to shoot but twill be some FUN!!! Yeah, there is that. But what’s up with that APP stuff....and cream o’ wheat?! No BP, no flame and topped off with breakfast cereal? Shooting Member of the Two Rivers Posse,Manteca Ca and the Coyote Valley Cowboys, Morgan Hill Ca. For years I was loading 5.5grns of Trailboss with a 205grn Bear Creek bullet. Any L.P primer would do. Worked flawlessly in my Marlin 1894CB rifle. The really fun load was 2,2CC Lee dipper of Graf & Sons 2f black powder and a 250grn Big Lube bullet from Springfield Slim. I've been using 6.1 grains of Titegroup over a 180 grain RNFP. Federal large pistol primers. Lately, I've been buying bullets from Badmanbullets. Not too light, not too heavy, powder and bullet costs are just a wee bit less than other choices. Well you guys sure brought the info. Thanks a lot. This was very helpful. I've reloaded for .308 before but never got into pistol calibers yet so this was very useful. Seems like Trail Boss has the best price per round I can find online and everyone seems to love that. I think I might go that route and see how I like it. Now to decide on which bullet. I've put a spread sheet together to help with prices per rnd and per oz and all that. I have some average loads in there just to get some prices. For your bullets you may want to look at missouri or outlaw bullets, they can get those down a bit. 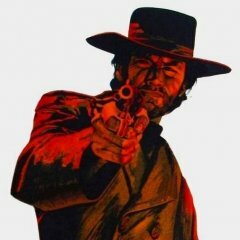 Outlaws seem pricey on their site. I added the Missouri to the spread sheet. They are pretty well priced. 6.5-7.0gn of Unique with 220-260 gn lead bullet. Use a firm roll crimp. Oh yea you're right. That's a great price! I updated a spreadsheet with the popular powders and some bullets. I have the cheapest round combination in there as well. I estimated the grains per round by averaging what I saw from a lot of different posts. You should add WW231 and Unique. You should add WW231﻿ and Unique. Ok I added those powders. If anyone wants me to add other powders or bullets let me know. I've been saving my brass from the ammo I bought last so save some more pennies. Great price on cheaperthandirt. This definitely helped me narrow down the options. It's interesting seeing the big differences in load sizes per powder manufacturer. Brings the rnds per jug of powder way down. Of course though everyone charges that hazmat fee for powders and primers. Brownells always seems to be running sales and free shipping a lot so that's very helpful. Not mentioned in this thread is the need to load bullets that will cycle reliably in your Marlin. Select a design you already know know feed reliably. Notice the number of times RNFP bullets are referenced. These usually feed well while wadcutter bullets sometimes do not. Your rifle uses heavy bullets and shipping them to you is a major part of their cost. If you can attend a CAS match where a bullet caster delivers bullets you can purchase them without shipping charges. You need also to ask what hardness bullet to purchase and what diameter they should be sized to. BTW, if you every decide to shoot real black powder or one of the subs, your Marlin is very easy to clean. Go forth and punch big holes in tin cans . 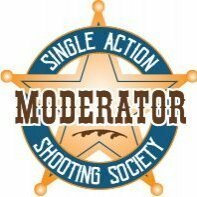 . .
X 2 on the use of semi-wadcutters in your rifle. I shoot a '66 and a '73, both of which are Jam-O-Matics with semi-wadcutters. 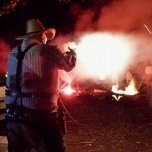 If you have any to burn up, do it in your revolvers. 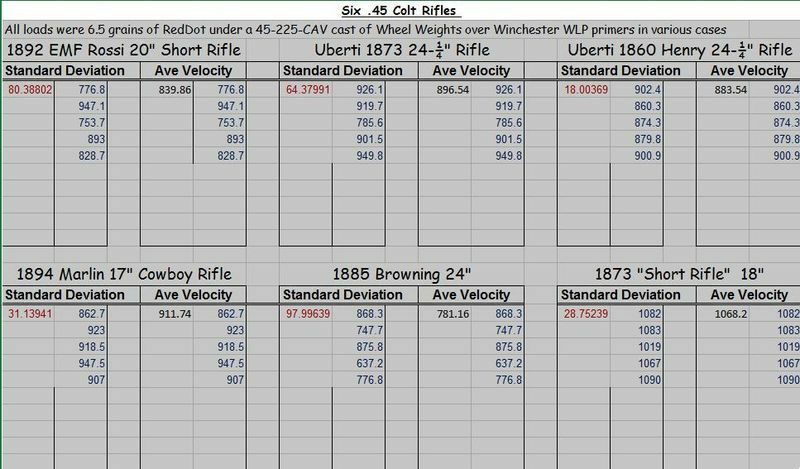 Makes sense since I've bought the American Quality Ammo(SWC) I listed before and had probably about 20 jams or so 2 of which where pretty bad. RNFP seems the way to go like you've pointed out. I've never even seen the mention of bullet hardness. Granted I've never been looking for it or even knew it was a thing. Isn't the diameter suppose to be .452? It's a lead bullet thing, as opposed to jacketed rounds you've probably loaded for .308. If you look at MO Bullet's website, you'll see Brinell and a number following. The higher the number, the harder the lead alloy. 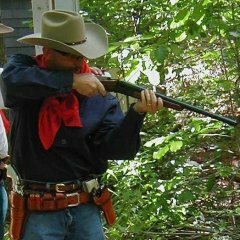 Lower is softer lead which is good for cowboy action loads and black powder. Helps the bullet obturate better to engage the barrel rifling with less less lead fouling. This book does a great job of explaining cast bullet hardness and its relationship to various rifle grooves and loads. Lots of info in there too for lead rifle and pistol rounds. Best manual I ever got for our game. I use Bang And Clang Bullets. Soft and very accurate. You might want to check your math. I checked your trailboss numbers. The price per round is .002 not .02. Thanks for the info. I'll have to pick up that book. Unless I'm missing something the 9oz bottle at $15.99. Average bottle having 787-5gr loads. 15.99\787=0.02031.